People choose your business for a reason. 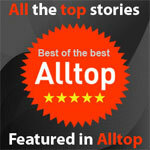 It may be convenience, service, quality, the “in” thing to do, or a combination. Knowing why your customers choose your company and how they want to be served is critical to creating a sustainable growth strategy. 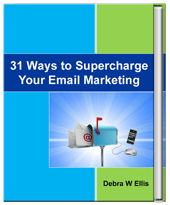 Without this knowledge, your marketing can do little more than fire shots in the dark. 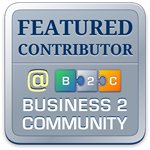 Some companies create detailed personas to describe the people that patronize their business. Personas are an excellent tool for identifying target markets. They can be used for marketing, merchandising, and service. The key to using them well is to recognize that every business has multiple personas and there will always be exceptions. What happens when companies don’t know their customers? A few days later, A&E reinstated Robertson with this statement, “As a global media content company, A+E Networks’ core values are centered around creativity, inclusion and mutual respect. We believe it is a privilege for our brands to be invited into people’s home and we operate with a strong sense of integrity and deep commitment to these principals. That is why we reacted so quickly and strongly to a recent interview with Phil Robertson. While Phil’s comments made in the interview reflect his personal views based on his own beliefs, and his own personal journey, he and his family have publicly stated they regret the “coarse language” he used and the mis-interpretation of his core beliefs based only on the article. He also made it clear he would “never incite or encourage hate.” We at A+E Networks expressed our disappointment with his statements in the article, and reiterate that they are not views we hold. But Duck Dynasty is not a show about one man’s views. It resonates with a large audience because it is a show about family… a family that America has come to love. As you might have seen in many episodes, they come together to reflect and pray for unity, tolerance and forgiveness. These are three values that we at A+E Networks also feel strongly about. In a nutshell, an outspoken character made a controversial statement. Two brands alienated their customer base by trying to distance their companies from the character. One brand read the currents well and emerged from controversy stronger. Know your customers better than anyone else. 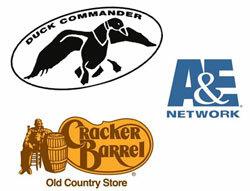 The Duck Commander family has a clear understanding of the people that love their products and characters. They used that knowledge as leverage against A&E. When in doubt, wait. A&E and Cracker Barrel reacted quickly to the controversy. If they had waited before responding, it may have become a non-issue. Don’t straddle the fence. Cracker Barrel confused people by removing “selected products which we were concerned might offend some of our guests.” If the selected products were offensive, why were they in a family friendly business? Use knowledge of your customers to make business decisions. There will always be advocacy groups promoting their causes. Don’t let the fear of outsider influence hurt your company’s relationship with customers. If you make a mistake, correct it quickly. 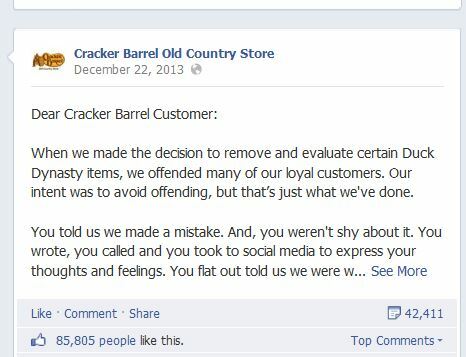 Cracker Barrel responded quickly to customer and fan feedback. Reversing the company’s position minimized the damage. Know your customers well enough to anticipate their response. 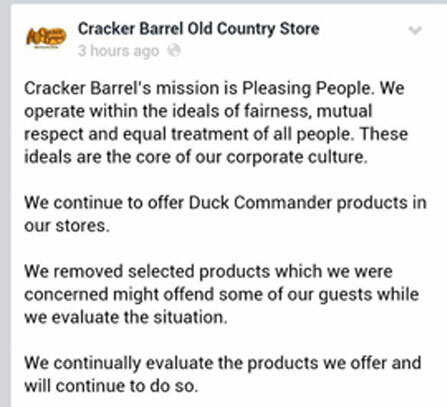 The response of Duck Dynasty fans and Cracker Barrel customers should have been anticipated. Judging from the online commentary, it appears the only ones surprised were A&E and Cracker Barrel. Timing is everything. The response from the Robertson family came after their fans created supportive Facebook pages and petitions. There was minimal risk for the Robertson and Duck Commander brands. 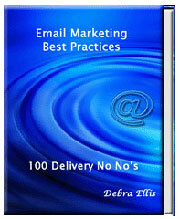 For information on how to get to know your customers, email Debra at dellis@wilsonellisconsulting.com.